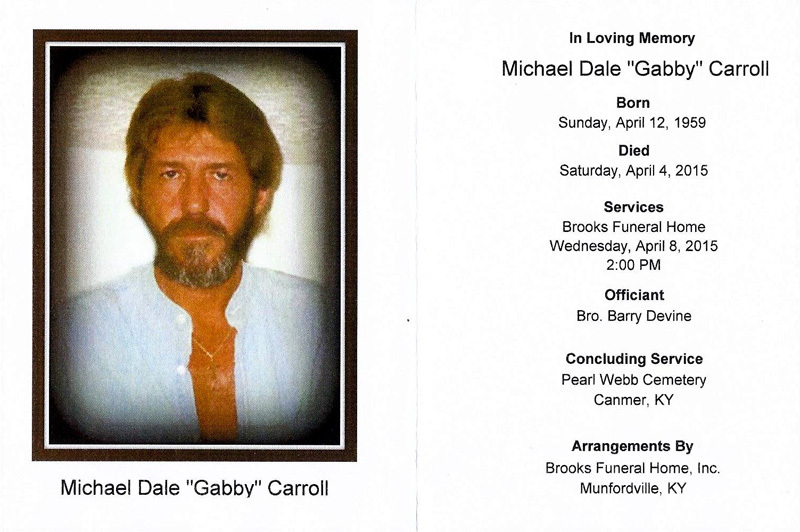 Michael Dale "Gabby" Carroll, age 55, of Munfordville, KY, passed away Saturday, April 4, 2015, at his residence in Munfordville, KY. He was a farmer and loved Kentucky Wildcats. The Hart County native was the son of Overt Carroll of Munfordville and Etta Logsdon Puckett of Horse Cave. He was the husband of Wanda Ramsey Carroll. Besides his parents and wife, he is survived by one son, Brandon Michael Carroll, Magnolia, KY; one granddaughter, Trinity Carroll; three step sons, Billy Price, Tony Price, Brian Price all of Munfordville, KY; Step father, Jimmy Puckett, Horse Cave, KY; four sisters, Wanda Long and husband W.T. , Hardyville, KY, Jenne Trulock and husband Mark, Hardyville, KY, Tracy Avery and husband Delbert, Munfordville, KY, Cynthia Easley and fiance Brad Koon, Leitchfield, KY; father & mother-in-law, Faye & Randall Ramsey; brother-in-law, Wayne & Monique Ramsey; sister-in-law, Emily & Kevin Hayes; nieces & nephews, Deven Avery and his son Kamdyn Avery, Cierria Highbaugh and her son Wyatt Highbaugh, Heather Easley, Dylan Easley, Emree Koon. The family will receive friends from 11:00 AM to 8:00 PM, Tuesday, April 7, 2015 and from 9:00 AM to 2:00 PM, Wednesday, April 8, 2015 at Brooks Funeral Home. Funeral service will be 2:00 PM, Wednesday, April 8, 2015 at Brooks Funeral Home with Bro. Barry Devine officiating. Interment will be at Pearl Webb Cemetery, Canmer, KY.
Memorial donations can be made to Michael Dale Carroll Memorial fund and left at Brooks Funeral Home for funeral expense.